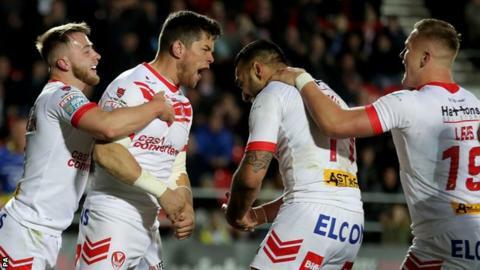 St Helens won the battle of Super League's leading two clubs to overtake Warrington at the top of the table. Mike Cooper's yellow card for a high tackle turned the game in the favour of the hosts, who scored twice in quick succession while he was off the field to lead by 14 points at half-time. Matty Lees and England winger Tommy Makinson touched down either side of Grace's score to send Justin Holbrook's team two points clear at the top of the table. The early exchanges promised as much, with Saints' Mark Percival replying to Blake Austin's opener for Warrington. However, the result rarely looked in doubt once St Helens had taken full advantage of Cooper's 10-minute absence in the sin-bin for catching Danny Richardson with a high shot. Clark's try could have been the catalyst for a Warrington fightback, but that prospect quickly disappeared when they conceded almost immediately, Lees profiting from the Wire's failure to deal with Lachlan Coote's high bomb to score under the posts. "I'm extremely pleased. The way we played the 80 minutes was outstanding. "We clearly got dominated in all aspects of the game. We just didn't hit those marks tonight. "20 minutes after half-time, we were getting back into the groove and we got back within eight, but then they scored the kick-try under the posts. "Full credit to St Helens - they wanted it more than us and they played accordingly. We've got a big Easter period and we'll get ready for Salford on Friday."